Stocks were headed for early losses Friday after a strong jobs report added to concerns that the Fed may take its foot of the gas sooner than expected. Stronger economic data Thursday reignited talk that the Federal Reserve may begin tapering the bond purchases that have helped drive markets to record highs. U.S. stock futures were lower, a day after major U.S. indexes all fell sharply. The U.S. economy added 204,000 jobs in October, according to the Labor Department. That is higher than the 120,000 estimate of economists surveyed by CNNMoney. The unemployment rate rose to 7.3% from 7.2%. The payroll gains came despite a partial government shutdown in October, which many economists had feared would hurt the economy. Separately, the Commerce Department said personal income rose 0.5% in September, while spending edged up 0.2%. At 9:55, the University of Michigan and Thomson Reuters release their consumer sentiment index. Investors will also be watching Twitter (TWTR) on Friday as it enters its second day of trading. Twitter shares closed at $44.90 on Thursday, a whopping 73% gain from its initial public offering price of $26. Groupon (GRPN) shares bounced back after disappointing earnings and a weak outlook sent the stock down 5% after hours Thursday. Walt Disney (DIS) reported slightly better-than-expected earnings and sales. 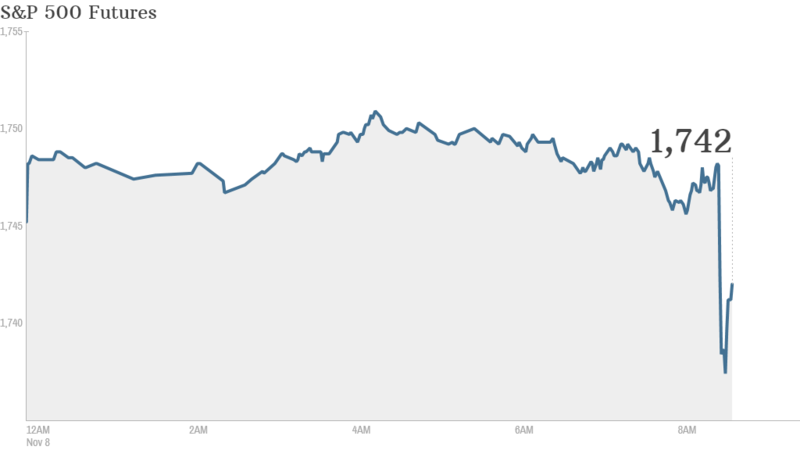 European markets were falling in morning trading, tracking a negative finish on Wall Street. The CAC 40 was the weakest of the major regional indexes, falling 0.8% after S&P downgraded France's long term credit rating by one notch to AA. Asian markets chalked up big losses despite strong China trade data. Japan's Nikkei fell 1% and the Shanghai Composite was down 1.1%.